250 Custom Sticker Sheets, prices starting at $117.92. For the designers reading this we have some basic dieline guidelines. It's best if the die has no hard corners, slightly radius the edges. Two opposite sides of the sticker sheet need apx. 0.375" safety zone. The other 2 opposite sides 0.5" safety zone. Each sticker needs .125" bleed and inset margins and each sticker has to be .0625" away from each other. Nope we don't charge for dies or dielines. Our laser die-cutting has eliminated physical dies and die charges. If you want a silkscreen printed sticker sheet, we still must make an old school die out of wood and steel to cut your stickers. We charge for silkscreen dies that we make. 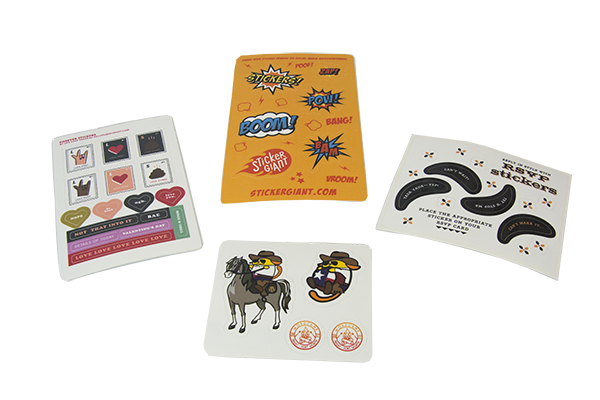 If you are developing a new product that has a set of decals, labels or stickers, you may consider a "Label Set" that has all the stickers for a single product on it. Short run and prototyping products in this way can save money and time. Using sticker sheets also keeps label and sticker inventories organized if they come in sets.